For uniform sands & gravels a set of standard graphs is created for a spatial or transport volumetric concentration Cvs of 17.5% and 9 particle diameters. For other concentrations the graphs/curves may differ, especially the volumetric transport concentration Cvt graphs/curves. The hydraulic gradient im equals the pressure gradient divided by the density of the carrier liquid ρl and the gravitational constant g. The pressure gradient is the pressure Δpm required to pump a mixture over a certain length of pipeline ΔL divided by this length ΔL. 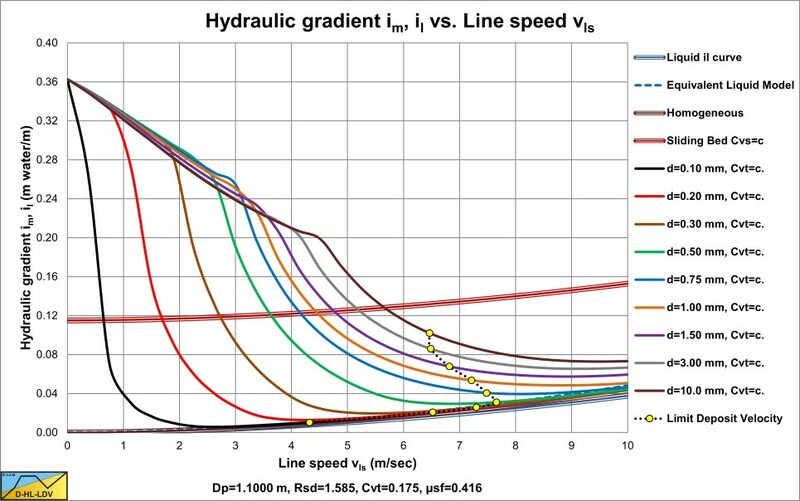 The advantage of the hydraulic gradient im versus the line speed vls graph is that it relates directly to dredging practice and can easily be combined with pump curves in order to determine the working point of a pump/pipeline system. The disadvantage is that it depends strongly on the volumetric concentration Cvs or Cvt and the relative submerged density Rsd, so for different concentrations and/or relative submerged densities different graphs have to be made. 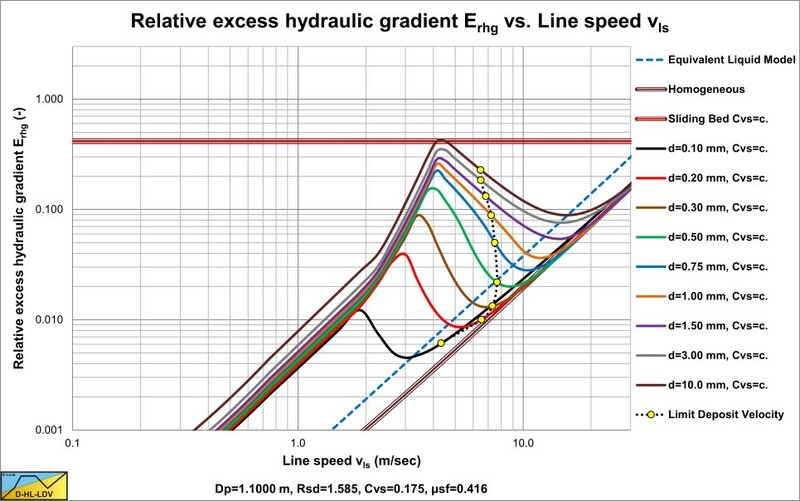 Multiplying the hydraulic gradient im with a factor 1000 gives the mixture pressure loss for a ΔL=100 m pipe with water as the carrier liquid. Two graphs are shown, first the graph for constant spatial volumetric concentration Cvs curves (often laboratory conditions) and second a graph for constant transport volumetric concentration Cvt curves (dredging practice). The basic DHLLDV Framework is based on constant spatial volumetric concentration Cvs and consists of 4 main flow regimes, which may be subdivided into a larger set of sub-regimes. The regimes are the fixed bed regime (FB) without or with sheet flow, the sliding bed regime (SB), the heterogeneous regime (He) and the homogeneous regime (Ho). Only at high particle diameter to pipe diameter ratios (>0.015) a 5th regime may occur, the sliding flow regime (SF). The constant transport volumetric concentration Cvt curves are derived from the constant spatial concentration Cvs curves and a holdup function or slip factor relation. This holdup function depends strongly on the Limit Deposit Velocity. 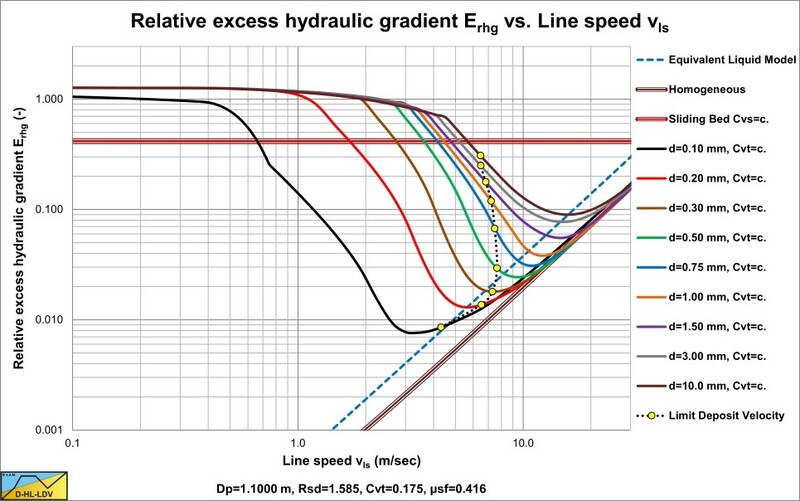 The relative excess hydraulic gradient Erhg equals the difference between the mixture hydraulic gradient im and the liquid hydraulic gradient il divided by the volumetric concentration Cvs or Cvt and the relative submerged density Rsd. 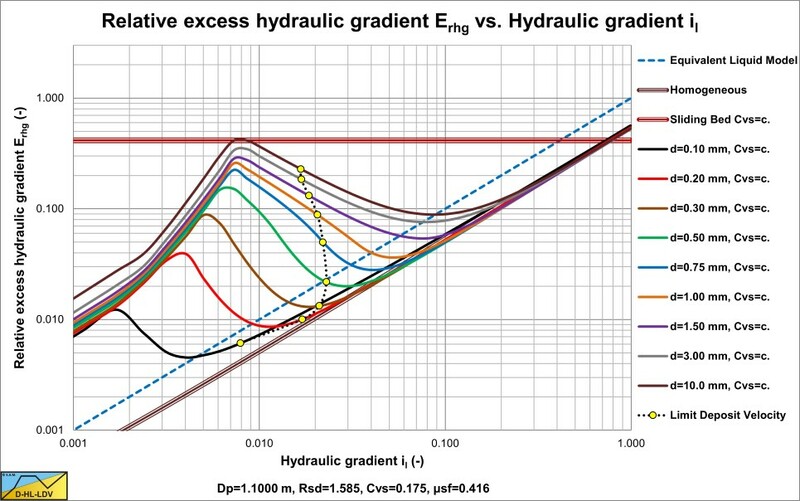 The advantage of using the relative excess hydraulic gradients is that for the constant spatial volumetric concentration Cvs case this parameter is almost independent of parameters like the concentration and the relative submerged density. However for the constant transport volumetric concentration case it depends strongly on the concentration below the Limit Deposit Velocity. 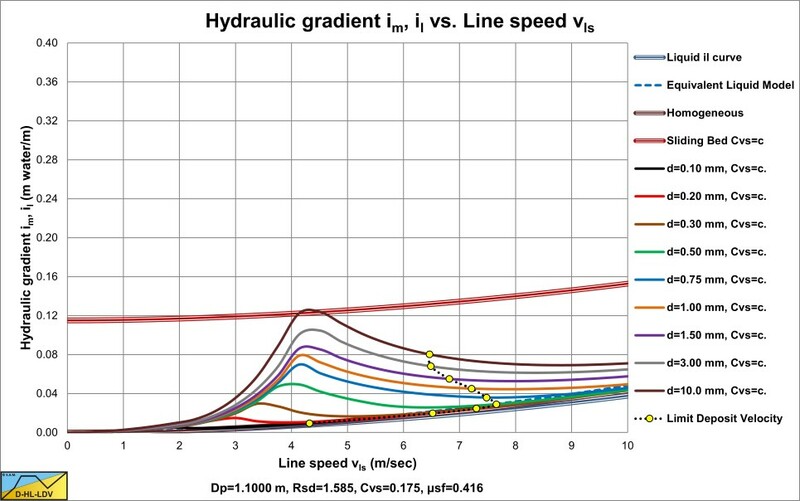 The advantage of plotting this parameter versus the line speed is that the value can be related to dredging practice where the line speed is a known. 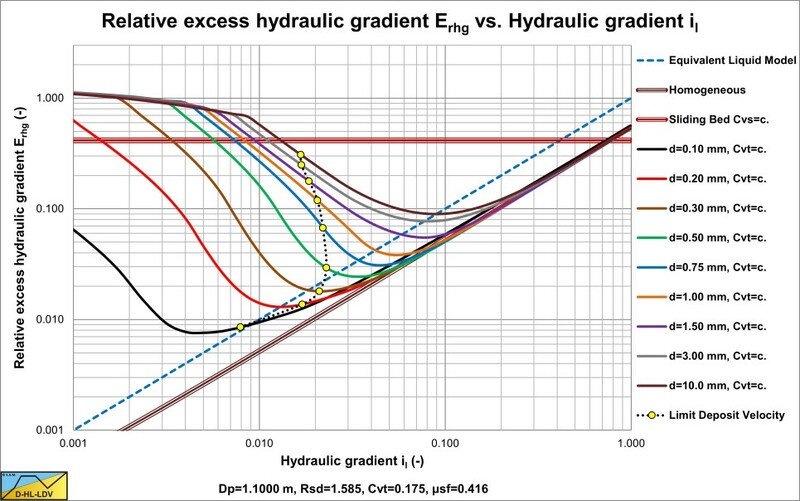 The advantage of using the relative excess hydraulic gradients is that for the constant spatial volumetric concentration Cvs case this parameter is almost independent of parameters like the concentration and the relative submerged density. However for the constant transport volumetric concentration Cvt case it depends strongly on the concentration below the limit deposit velocity. The advantage of plotting this parameter versus the hydraulic gradient of the carrier liquid makes the graph almost dimensionless. The basic DHLLDV model is based on constant spatial volumetric concentration Cvs and consists of 4 main flow regimes, which may be subdivided into a larger set of sub-regimes. The regimes are the fixed bed regime (FB) without or with sheet flow, the sliding bed regime (SB), the heterogeneous regime (He) and the homogeneous regime (Ho). Only at high particle diameter to pipe diameter ratios (>0.015) a 5th regime may occur, the sliding flow regime (SF).